I have raved about Amy Poehler’s Smart Girls site several times on this blog. The work this former Saturday Night Live and Parks and Rec actress/comedian is doing to inspire girls and give them positive role models is phenomenal. 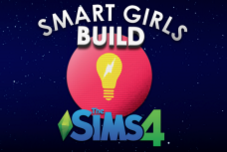 Now the site offers a new video series that pairs girls with the creators of The Sims video game to show how the talents and passions that the girls have can be used in a video game to express themselves and inspire others. The “Smart Girls Build” series currently has three episodes that showcase dance, music, and photography. They are relatively short (about 5 minutes each), but give great insight into how The Sims developers pay close attention to detail to make the game include realistic interpretations of each of the girls. We need more girls to pursue careers in technology, yes. But, even more importantly, we need them to see that their passion to create is valued and has enormous potential in an infinite number of hobbies and careers.